Kanazakura Shrine (金櫻神社) is one of the oldest shrines in Japan. It is located deep side of Shosen Valley, Kofu city, Yamanashi Prefecture. It enshirnes Mt. Kimpu. The shrine is located where people can see both Mt. Fuji and Mt. Kimpu. There are many giant Cedar trees that you can hear the sound of water pass. On the back side of the shrine, there is Ukon Sakura, Golden Cherry Blossom, that only exists here and Kyoto. 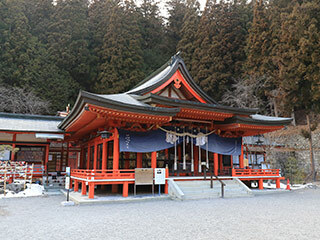 Kanazakura Shrine is the birthplace of Japanese Crystal Industry. 1. use a local bus to Kanazakurajinja mae. Enshrine: Sukunabikono Mikoto, Okuninushi, Susano, Yamatotakerunomikoto and Kushinada hime. Reitaisai: April 21 and 22. Kanazakura Shrine was established about 2000 years ago when it is the time of Emperor Sujin. The deep srine is located on the top of Mt. Kimpu. This place has a great view of both Mt. Fuji and Mt. Kimpu. Mt. Kimpu is also known as the mountain of Crystals. People of this shrine created crystal jewelry first in Japan. Also, the Ukon, Golden Sakura is very famous. The giant cedar trees are about 700 to 800 years old.